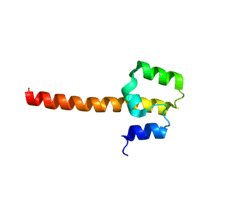 Transcription factor NF-E2 45 kDa subunit is a protein that in humans is encoded by the NFE2 gene. It is involved in megakaryocyte production. NFE2 has been shown to interact with CREB-binding protein. ↑ Ney PA, Andrews NC, Jane SM, Safer B, Purucker ME, Weremowicz S, Morton CC, Goff SC, Orkin SH, Nienhuis AW (Sep 1993). "Purification of the human NF-E2 complex: cDNA cloning of the hematopoietic cell-specific subunit and evidence for an associated partner". Mol Cell Biol. 13 (9): 5604–12. doi:10.1128/mcb.13.9.5604. PMC 360284 . PMID 8355703. ↑ "Entrez Gene: NFE2 nuclear factor (erythroid-derived 2), 45kDa". ↑ Gasiorek JJ, Blank V (2015). "Regulation and function of the NFE2 transcription factor in hematopoietic and non-hematopoietic cells". Cellular and Molecular Life Sciences. 72 (12): 2323–2335. doi:10.1007/s00018-015-1866-6. ↑ Hung HL, Kim AY, Hong W, Rakowski C, Blobel GA (Apr 2001). "Stimulation of NF-E2 DNA binding by CREB-binding protein (CBP)-mediated acetylation". J. Biol. Chem. 276 (14): 10715–21. doi:10.1074/jbc.M007846200. PMID 11154691. Strauss EC, Andrews NC, Higgs DR, Orkin SH (1992). "In vivo footprinting of the human alpha-globin locus upstream regulatory element by guanine and adenine ligation-mediated polymerase chain reaction.". Mol. Cell. Biol. 12 (5): 2135–42. PMC 364385 . PMID 1569944. Pischedda C, Cocco S, Melis A, Marini MG, Kan YW, Cao A, Moi P (1995). "Isolation of a differentially regulated splicing isoform of human NF-E2". Proc. Natl. Acad. Sci. U.S.A. 92 (8): 3511–5. doi:10.1073/pnas.92.8.3511. PMC 42197 . PMID 7724591. Shivdasani RA, Rosenblatt MF, Zucker-Franklin D, Jackson CW, Hunt P, Saris CJ, Orkin SH (1995). "Transcription factor NF-E2 is required for platelet formation independent of the actions of thrombopoietin/MGDF in megakaryocyte development". Cell. 81 (5): 695–704. doi:10.1016/0092-8674(95)90531-6. PMID 7774011. Igarashi K, Kataoka K, Itoh K, Hayashi N, Nishizawa M, Yamamoto M (1994). "Regulation of transcription by dimerization of erythroid factor NF-E2 p45 with small Maf proteins". Nature. 367 (6463): 568–72. doi:10.1038/367568a0. PMID 8107826. Chan JY, Han XL, Kan YW (1994). "Isolation of cDNA encoding the human NF-E2 protein". Proc. Natl. Acad. Sci. U.S.A. 90 (23): 11366–70. doi:10.1073/pnas.90.23.11366. PMC 47983 . PMID 8248255. Toki T, Itoh J, Kitazawa J, Arai K, Hatakeyama K, Akasaka J, Igarashi K, Nomura N, Yokoyama M, Yamamoto M, Ito E (1997). "Human small Maf proteins form heterodimers with CNC family transcription factors and recognize the NF-E2 motif". Oncogene. 14 (16): 1901–10. doi:10.1038/sj.onc.1201024. PMID 9150357. Blank V, Kim MJ, Andrews NC (1997). "Human MafG is a functional partner for p45 NF-E2 in activating globin gene expression". Blood. 89 (11): 3925–35. PMID 9166829. Gavva NR, Gavva R, Ermekova K, Sudol M, Shen CJ (1997). "Interaction of WW domains with hematopoietic transcription factor p45/NF-E2 and RNA polymerase II". J. Biol. Chem. 272 (39): 24105–8. doi:10.1074/jbc.272.39.24105. PMID 9305852. Mosser EA, Kasanov JD, Forsberg EC, Kay BK, Ney PA, Bresnick EH (1998). "Physical and functional interactions between the transactivation domain of the hematopoietic transcription factor NF-E2 and WW domains". Biochemistry. 37 (39): 13686–95. doi:10.1021/bi981310l. PMID 9753456. Hung HL, Kim AY, Hong W, Rakowski C, Blobel GA (2001). "Stimulation of NF-E2 DNA binding by CREB-binding protein (CBP)-mediated acetylation". J. Biol. Chem. 276 (14): 10715–21. doi:10.1074/jbc.M007846200. PMID 11154691. Gavva NR, Wen SC, Daftari P, Moniwa M, Yang WM, Yang-Feng LP, Seto E, Davie JR, Shen CK (2002). "NAPP2, a peroxisomal membrane protein, is also a transcriptional corepressor". Genomics. 79 (3): 423–31. doi:10.1006/geno.2002.6714. PMID 11863372. Boulanger L, Sabatino DE, Wong EY, Cline AP, Garrett LJ, Garbarz M, Dhermy D, Bodine DM, Gallagher PG (2003). "Erythroid expression of the human alpha-spectrin gene promoter is mediated by GATA-1- and NF-E2-binding proteins". J. Biol. Chem. 277 (44): 41563–70. doi:10.1074/jbc.M208184200. PMID 12196550. Marini MG, Asunis I, Chan K, Chan JY, Kan YW, Porcu L, Cao A, Moi P (2003). "Cloning MafF by recognition site screening with the NFE2 tandem repeat of HS2: analysis of its role in globin and GCSl genes regulation". Blood Cells Mol. Dis. 29 (2): 145–58. doi:10.1006/bcmd.2002.0550. PMID 12490281. Onishi Y, Kiyama R (2003). "Interaction of NF-E2 in the human beta-globin locus control region before chromatin remodeling". J. Biol. Chem. 278 (10): 8163–71. doi:10.1074/jbc.M209612200. PMID 12509425. Chuen CK, Li K, Yang M, Fok TF, Li CK, Chui CM, Yuen PM (2004). "Interleukin-1beta up-regulates the expression of thrombopoietin and transcription factors c-Jun, c-Fos, GATA-1, and NF-E2 in megakaryocytic cells". J. Lab. Clin. Med. 143 (2): 75–88. doi:10.1016/j.lab.2003.09.006. PMID 14966463.